Microsoft Office Excel 2010 uses Calibri font in font size 11 as the default body font when typing data in a worksheet, header or footer, or text box. Excel users may want to enter text in another font type or font size that will be used or applied by default when entering text for all new workbooks created. In the General category, under When creating new workbooks section, select the font to use in the Use this font drop down box. Optionally, select a preferred font size for the font type in the Font Size box. Click OK again when prompted with “for your change to the standard font to take effect, you must quit and then restart Microsoft Excel” dialog box. Close all Excel windows and restart Excel 2010, and the new default font and font size will be applied to new workbooks created. 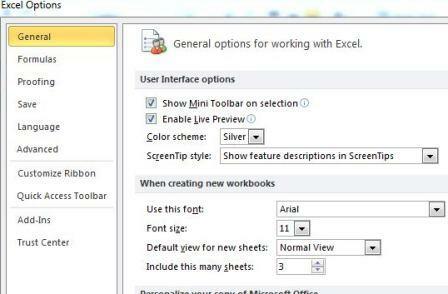 Tip: The new default font and font size are used only in new workbooks that are been created after restarting Excel; existing workbooks are not affected.